A timer is a type of clock used for the measurement of time intervals. There are two types of timer, one which counts upwards from zero, for the measurement of the elapsed time, called as Stopwatch. And, the second one counts down from a specified time duration provided by the user, generally called as Countdown Timer. Here, in this tutorial we will show you how to make a Countdown Timer using Arduino. Here we are not using any Real Time Clock (RTC) module for getting the time. The time duration is provided by the user with the help of Keypad and 16x2 LCD. And when the timer reaches to Zero, alert sound will be produced with the help of Buzzer. Arduino Uno is used here as main controller. A keypad is used for feeding the time duration and a 16*2 LCD is used to display the countdown. The pushbutton is used to start the time. 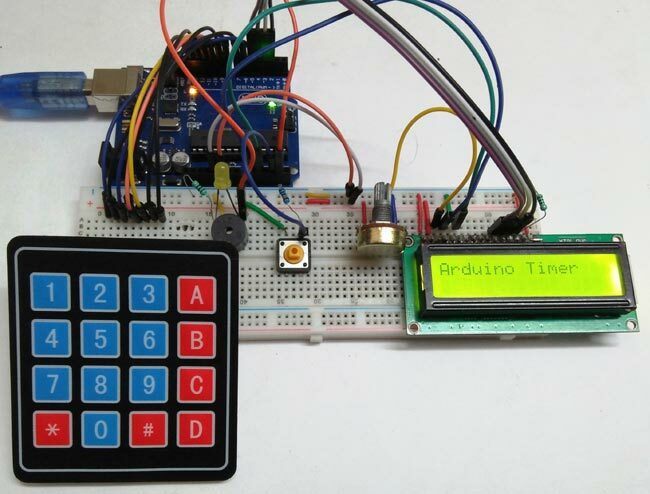 Check here how to interface 4x4 Keypad with Arduino and 16x2 LCD with Arduino. Complete Arduino Timer code is given at the end of this Project. In this code below, we are initializing libraries for keypad and LCD and the variables used in the code. Now, in the below code we are initializing the no. of rows and columns for defining the matrix for keypad. For connecting the 4*4 matrix keypad with Arduino we have to define the pins for the rows and columns. So in below code we have defined pins for Keypad as well as 16x2 LCD. In the void setFeedingTime() function code, after pressing the pushbutton we are able to enter the time for timer, then after entering the timer time duration, we have to Press D to begin the countdown. In void setup() function, we have initialized the LCD and serial communication, and defined the pins as INPUT and OUTPUT in the below code. Working of this Arduino Timer is simple but the code is a little complex. The code is explained by the comments in the code. Initially, it will print “Arduino Timer” on the LCD display until you press the pushbutton. As soon as you press the pushbutton, it will ask to enter countdown time duration by calling the “setFeedingTime” function. Then you can enter the time duration with the help of Keypad. Then you need to press ‘D’ to save the time and begin the countdown timer. Here in void loop() function, we have done some calculation to decrement the time second by second and to show the proper values of Hour, Minutes and Seconds (HH:MM:SS) according to the remaining time. All the code is well explained by comments. You can check the complete code and Demonstration video below. As the timer reaches to zero, the buzzer starts beeping and beeps for 100 times only (as per the code). To stop the buzzer, press and hold the pushbutton. You can use the Pushbutton anytime to stop the timer in between counting. hours = String (r) + String (r) ; //combining two separate int values of r and r into one string and save it to "hours"
minutes = String (r) + String (r) ; //combining two separate int values of r and r into one string and save it to "minutes"
seconds = String (r) + String (r) ; //combining two separate int values of r and r into one string and save it to "seconds"
I can't seem to find the Keypad code, could you please attach or send me to the website to download. Me too and error appear below. "Error compiling for board Arduino/Genuino Uno"
Very nice project , was OK at the first time . I use it for my PCB printing machine . Keep up the good work. I need a 6 month countdown timer to act as a 'service indicator'. Can this project be amended to either a) Add more hour values (i.e. HHHH:MM:SS - I would need 4320 hours by this means) or b) Add months and days values (i.e. MM:DD) as opposed to hours, minutes and seconds? Accuracy is not an issue, as we can afford quite a bit of leeway, but would there be any other issues in doing this? Could the unit handle a 15,552,000 (60 seconds x 60 minutes x 24 hours x 180 days) seconds countdown? Quite new to all this and looking for ideas on a project I have been asked to look at. days = String (r) + String (r) ; //combining two separate int values of r and r into one string and save it to "days"
seconds = String (r)+ String (r); //combining two separate int values of r and r into one string and save it to "seconds"